Alex Alvarez is best known as Lenny Kravitz's guitar tech, but after 25 years, he is in many ways Kravitz's right-hand man. For tours, he's the crew chief, responsible for hiring the crew, maintaining the equipment, and much more. Off tour, he manages Kravitz' studios in Paris and the Bahamas. 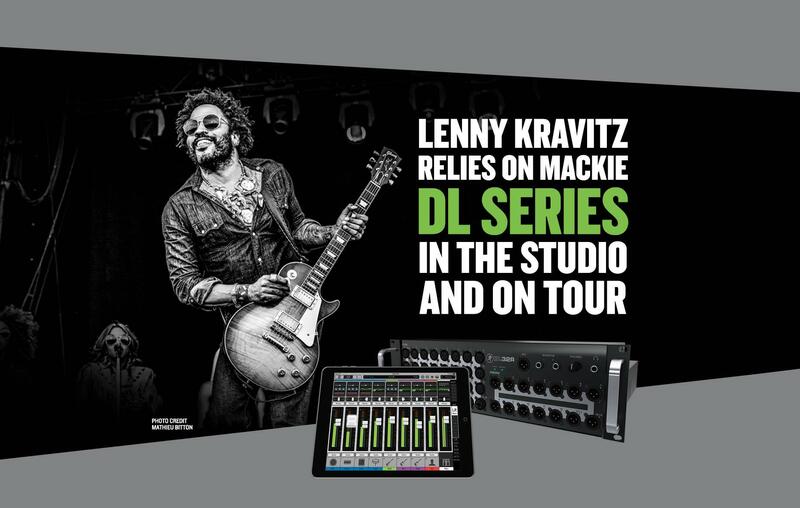 Wherever Kravitz and his band go, you'll find a Mackie mixer in use. "Lenny has been using small Mackie mixers in his keyboard rigs and practice rigs for years and years," Alvarez relates, "starting with the CR-1604VLZ. When the digital DL1608 and DL806came in, we started using those, and now we have the DL32R. We use them in an assortment of ways to fill various niches." Kravitz even employs his Mackie mixer before the show. "Lenny likes to use the DL806 as a personal vocal warm-up mixer," expounds Alvarez. "He likes to warm up in a reverberant space, and we may be at a festival where that isn't possible. But with the DL, he can warm up using the same reverb patch every time, so he has a consistent environment." Another application is as a keyboard mixer for rehearsals. "Sometimes Lenny rehearses with just the core band, and we need a small, high-quality mixer for the keyboards," Alvarez notes. "The DL1608 and DL806 are very good, compact mixers that have given us what we needed. Now I have the DL32R set up, and we're in the process of switching to it. It gives us a lot of significant additional features. For one, we will be able to easily record." Kravitz has a couple of U.S. tour dates lined up in May 2016, followed by a European tour, then back to the USA. His Mackie DL32R will accompany him all the way. "We are constantly traveling, and our gear has to work in every country we visit," explains Alvarez. "Mackie mixers are a great choice for that; we can rely on them wherever we go." Alvarez also anticipates the release of Mackie's AXIS Digital Mixing System, a flexible, modular digital mixing system that includes the DL32R mixer, DC16Control Surface, and DL Dante Expansion Card. "I am looking forward to the DC16," he confirms. "We like the Mackie Master Fader app's wireless control, and the control surface will expand our capabilities and address some issues." Consistency, reliability, international compatibility, portability, sound quality, and workflow-it all adds up to a winner for Alex Alvarez and Lenny Kravitz. "We've been using Mackie mixers for years," Alvarez remarks, "and they have proven to be a completely professional solution. With the new DL32R, we're taking the next step, and we're excited about the possibilities."